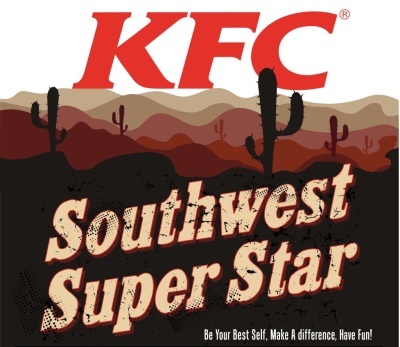 Franchisee & Team Members do to make KFC so great here in the Southwest Region..
Tim Richards operates the KFC store in Gallup NM. Tim has worked for 30 yrs in the KFC business, " He Bleeds Chicken"
He is a great mentor to his team. The Franchisee Wilma Taira / James Rich thank him for his service. 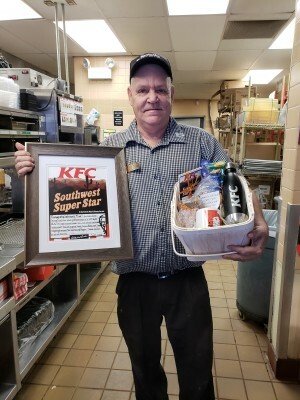 When Tim recieved his award he opened it and shared it with his team "That's the kind of guy he is"
Carolyn Rung has been with KFC for 28 years. During her time with KFC she has been an MTM for KFC and KT restaurants. She was best of the best 10 years in a row. She has been at her current KT location for 18 months. During this time Carolyn has promoted 8 shift supervisors without having an AGM. She has sent 2 additional shift supervisors to other restaurants that need additional shifts for their bench in the area. Currently she has 1 shift and 1 AGM in training on bench who will be complete with training by the end of the year. 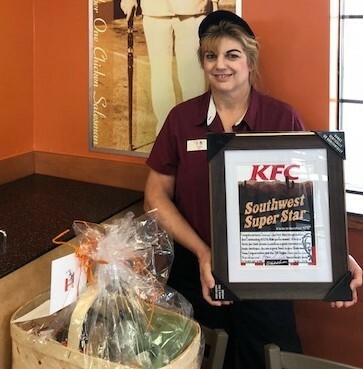 Carolyn also takes the lead in training KFC and KT shift supervisors in our shift classes that are held every quarter. This is a great way to share her knowledge and experience with Jr. managers coming up the ranks. She also trained 3 external RGM’s this year who are currently running their own restaurants. She also has 1 external RGM in training currently. Carolyn is in the process of training to be an RTL. I believe this position will help her grow as a leader and mentor to other RGM’s. She is currently at 73% VOC and 69% HFA for the year. She is beating labor budget for the year and she is very close on her COS budget. She is very consistent on daily systems and routines. She is averaging a 3 on Food safety for the year and is Green on ROCC and CORE for the year. Carolyn has proven herself year after year as a great operator and people developer. She is a great asset to our Region. was selected as one of three Southwest SuperStars in our first round of Super Star recognition for the Southwest Region. 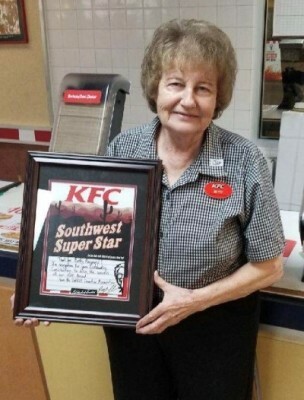 Betty Raymond went to work for KFC in Idabel, OK after raising 5 children as an hourly team member in June of 1984. About one year before Betty began her career at KFC, there was another lady who also started her career at KFC as an hourly team member. This is significant because in 1985, the other lady became an assistant manager. Then, in 1986, this lady was promoted to the RGM position and Betty was promoted to AUM. These two worked together in management about 22 years. These two ladies made an incredibile team. They were the dynamic duo. They worked hard. They were honest. They were reliable. They were consistent. They were loyal. They ran a successful operation in Idabel. They had an awesome team of hourly team members who worked for them for many years. A lot of them worked at KFC as a second job. They enjoyed working for their managers. There were five employees who had more than 10 years of service. The longest tenured hourly employee had 28 years of service. When the RGM made a decision to retire, she wanted to work as a team member for Betty, who was promoted to the RGM position. Betty continued to carry on their legacy at the Idabel store leading the team. Betty is known for being a kind, happy, warm, upbeat person. The Schoenhofer Organization is lucky to have Betty as an RGM in Idabel, OK. We wish her much continued success!